I've got to ask all of my readers to try to work with me and understand that this is not a traditional post--I'm going to speak from the heart about this book. I've never read anything by David, when I was in New York in May for Book Expo America I purchased Boy Meets Boy--but have yet to read it. 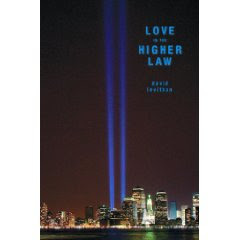 I was given a copy of Love is the Higher Law by a friend, at an event that I hosted in New York. She told me that the book was amazing, I wish that I had the chance to speed read through the book and understand what she meant at that time. I wish I had a chance to give her--a real new yorker--a hug. I'm not going to lie, this is the first book by David that I have read. While it is not the best book I have ever read, I kept noting that I could not find the plot of the story. The truth is how can there be a plot in something like September 11th, 2001. The people in New York were just left to gather their pieces and to protect their family. That is what this book is about. Three very real teens collecting the pieces of their life and trying to put it all back together again. This book didn't make me cry, but this book did pull me into New York for the short time that was September 11th 2001. The time that I, a teen from Michigan only witnessed on television. The last pieces of this book spoke to me, in which a comment was made that the president was not there---he did not feel the true pain that the city felt. As I was reviewing this book I said a few comments about this book. One mistake I made was saying to a friend that this book was plotless. The plot is there, I just didn't open my heart in time to see it. David is an amazing writer and after reading this book, knowing that he is from New York, I feel that he can overcome anything. I am glad you were able to see the beauty in this book after all. Perhaps it's it's because I was scared to death on September 11th that I would loose my cousin Sarah, but I was really able to relate to the overall scariness that was that day. It's a numbing feeling, and Claire seemed to have felt the same way.